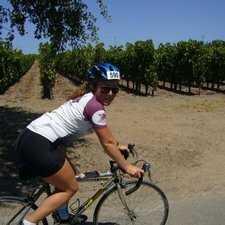 Arianne Goodman is the Founder of Gears and Grapes Getaways, Inc. She started bicycle touring at the age of 16. Since then she has led tours across the country, north to south and east to west. She has led tours in Europe as well as through Mexico and Central America. Arianne has also spent time living in both Chile and France and is fluent in French and Spanish. Her time in France gave her an incredible appreciation for the culture and joys of wine—something that she has since tried to share with first her family, then her friends, and now her guests. After completing her undergraduate studies Ari became a certified sommelier and started working in the wine industry in San Francisco. A lover of adventure, and all things outdoors, Ari is a wine loving triathlete with expertise that enriches and educates her guests. All reviews for Ari G.